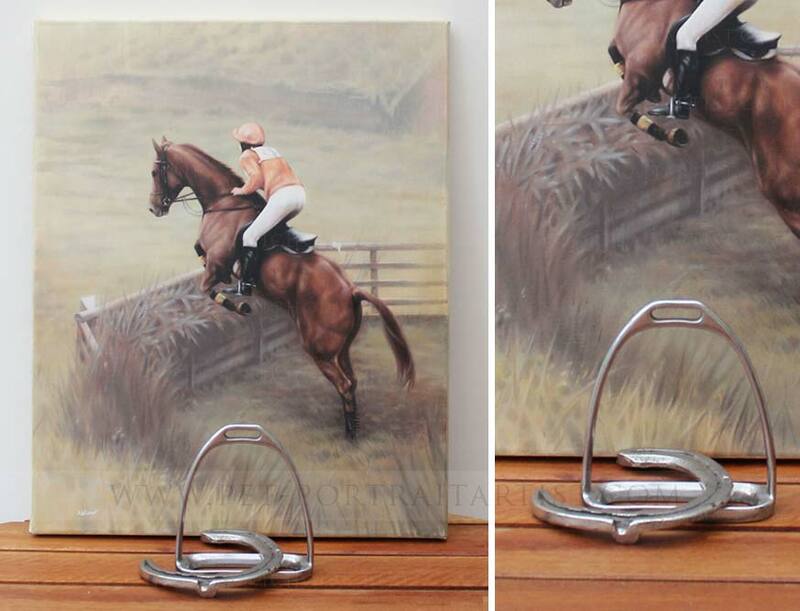 A popular pose for an oil painting is horse jumping portraits, whereby the rider is depicted on the horse either at an event or just practicing in the field. The photo for this kind of portrait is key and many clients opt to have a professional photographer take photos of them jumping as they will have all of the necessary camera equipment good enough to capture movement. 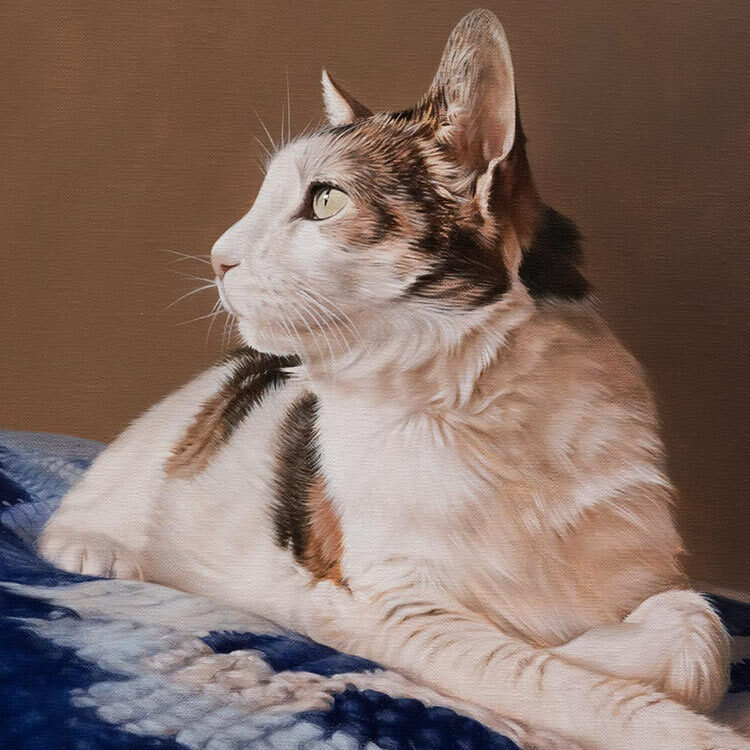 Once the perfect photo has been taken, Nicholas can paint it for you in oil on linen canvas. Read on to find out more about the commission of Frizbee and if you like our page, please feel free to share it using the buttons below. 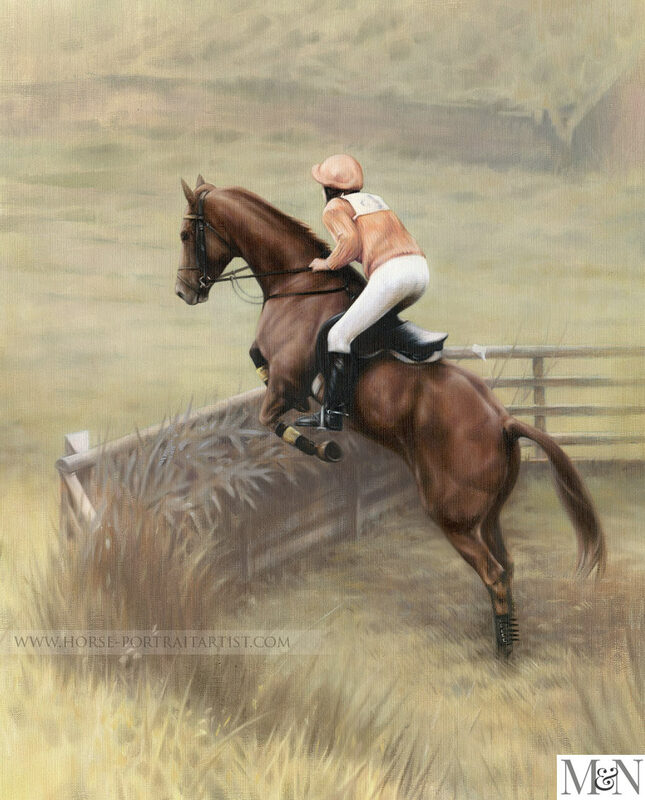 Lynne Furniss commissioned Nicholas to paint her horse Frizbee in 2011. Lynne had a favourite photo of both her and Frizbee jumping from many years ago. Lynne worked closely with Nicholas to make sure every part of the portrait was true to the day that Lynne was jumping with Frizbee. From the riders outfit, the positions of the tack and detail on the brushing boots. 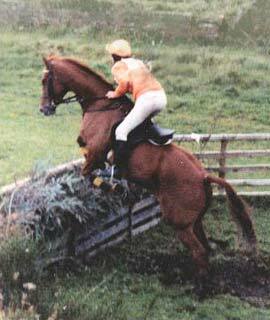 Lynne collected photographs of tack and equipment and collated them on a web page with written explanations. It was an invaluable resource for Nicholas to refer to during the painting process. Nicholas spent many hours at his easel painting the portrait at 20 x 16 size. It was quite a challenge, however with a combination of Nicholas studying the photos and Lynne's help, together they have created a successful painting that everyone is really happy with. 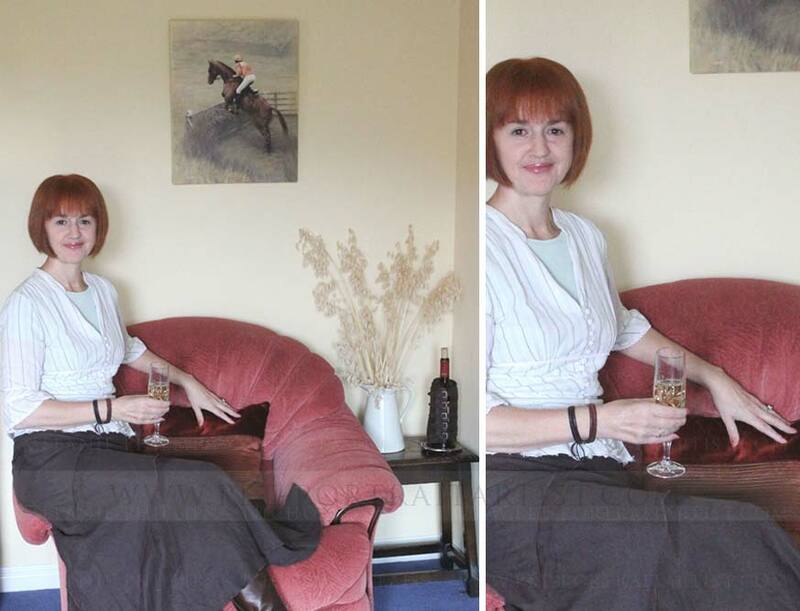 Lynne very kindly emailed us some photos that she had taken once the portrait had been displayed in situ, along with Lynne and a glass of Champagne. We are thrilled and delighted to add them to our website and are so pleased that Lynne is happy with her portrait! My husband took this photo this morning, as we both enjoyed a champagne toast to our new Frisbee oil portrait. There was a brief sunny spell, before the skies went grey again, so we grabbed the opportunity of using natural light. As you can see, I am delighted with this commission, which Nick created for me. It's fine to have photographs of a cherished pet, but oils have an almost magical quality. I really do believe that Frisbee is going to land over that fence and keep on galloping. So yes, this painting is very special indeed. Here are a few photos Lynne took of her portrait. 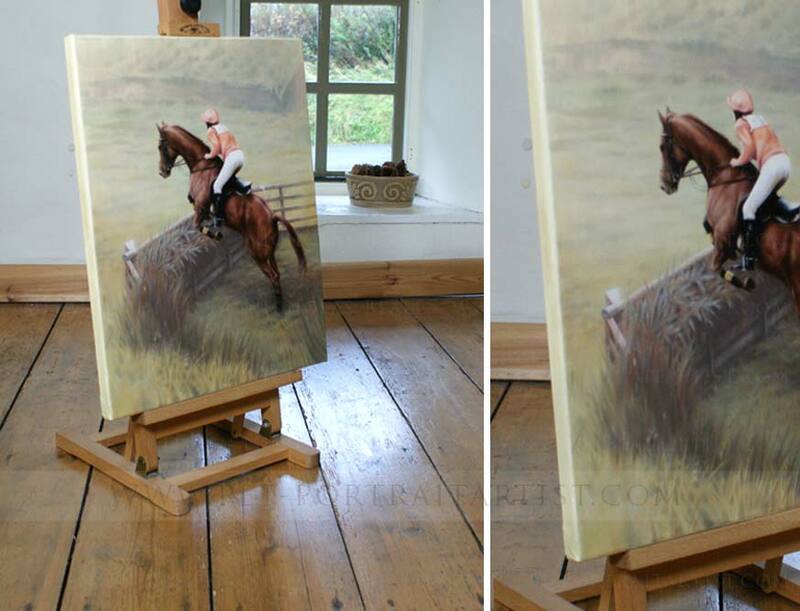 If you have the perfect photo of your horse jumping, or perhaps it is a great photo of your horse but the background isn’t so good, we can create you an oil painting incorporating a different background scene into your horse jumping photo and turn it into a beautiful, hand painted portrait for you to treasure. 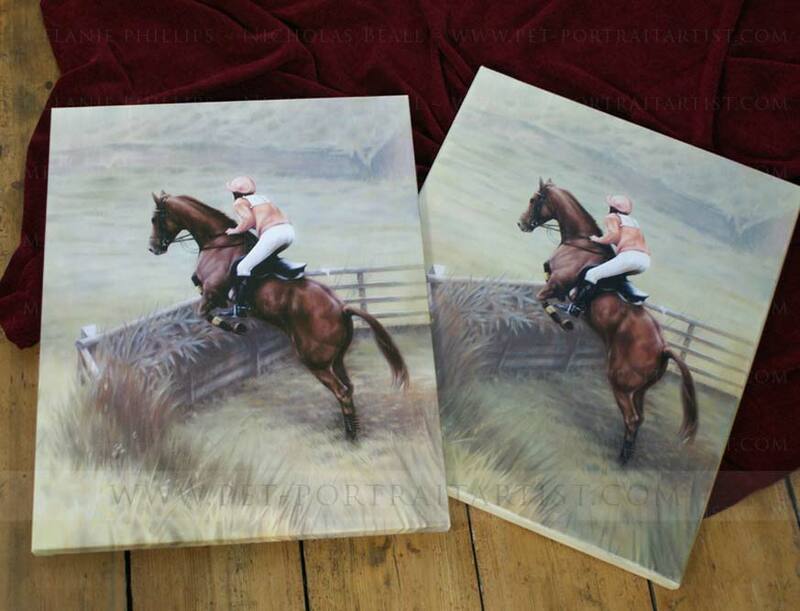 Why not email us horse portraits contact page and chat to us about your requirements.